What Could Have Been, and What Is. Before I start endlessly analyzing and fretting over the Hot Stove rumors, I want to talk about what is right before us: the League Championship Series. We have plenty of time to talk about the former–the void between the end of the postseason, and Spring Training. I have enjoyed watching these series even though the National League Championship Series didn’t end the way I wanted it to. I was completely surprised that the Dodgers lost in only five games. To be honest, I didn’t think they would get past the powerhouse of the Cardinals, let alone sweep them. With guys like Chris Carpenter, Adam Wainwright, Matt Holliday, and Albert Pujols, I thought that the Cardinals would have gone a lot further than they actually did. They had the caliber to be in and to win the World Series, but fate just didn’t have it that way. I thought they had Game 2 (I think it was?) in the bag when there were two outs and an easy fly ball was hit to Matt Holliday, but instead of catching it to win the ball game (and perhaps instill some confidence in the Cardinals), it hit him right in the crotch. The Dodgers seemed to have luck on their side, and it was a 2008 NLCS re-match. The Phillies may have an emerging postseason legend in Cliff Lee and the ego-maniacal Cole Hamels whose pride from winning the World Series last season seemed to cloud his ability to pitch well, but the Dodgers have a deep lineup, a good starting five and a fabulous bullpen. I really wanted the Dodgers to advance to the World Series as well because I knew that regardless of whomever won the ALCS, the World Series would be enticing as long as the Dodgers were there. Had the Dodgers advanced, they would have played either the Angels or the Yankees. If it was a matchup between the Dodgers and Angels, we would have had the first “subway series” since the one in New York in 2000. This subway series would have meant that I would have been up until roughly 2 am every morning, sleepwalking my way through school. Yet the intensity that arises from a series like this is so alluring, that a lack of sleep would have been well worth it. It’s almost like a civil war, and it will augment the rivalry between the two teams like nothing else can. Not that I would ever root for the Yankees, but if the Dodgers were representing the National League, I can’t say I would have minded too much if the Yankees were to advance. It would have been Joe Torre vs Joe Girardi. The Yankee manager that was fired for his supposed inability to advance the Yankees to the World Series despite their winning four World Championships under his leadership. Anyway, the Dodgers vs Yankees would have been a great matchup, and of course I would have been rooting for the Dodgers even though it hurts me to see Manny Ramirez’s postseason heroics. Instead of dwelling over what could have been, I suppose it’s best to look at what we have at hand: the Phillies advanced to the World Series, and Game 6 between the Angels and the Yankees is tonight. I don’t like the Phillies. I root for the Marlins because I live in South Florida, and the Phillies are the Marlins’ division rivals. I may be a bit jealous because the Phillies did what the Red Sox failed to do last year–advance to the World Series for the second year in a row (please don’t hate me Phillies fans, I respect your team nonetheless). They could be the first team since the Yankees to repeat World Series victories, and the second team this decade to have two World Series victories (the first, of course, was the Red Sox). I guess it’s just that having the Phillies in the World Series doesn’t excite me as much as the Dodgers would have. Tonight, I’m rooting for the Angels–just like I have been for the entire ALCS. Although it’s hard to admit, they played better baseball than the Red Sox did. I know that they are a good team, and I know that they have what it takes to beat the Yankees. It is so foreign to me to be rooting for Bobby Abreu since I’ve always had something against him for taking Juan Pierre’s spot in the All-Star game a couple of years ago (the fact that he played for the Yankees only augmented this feeling). 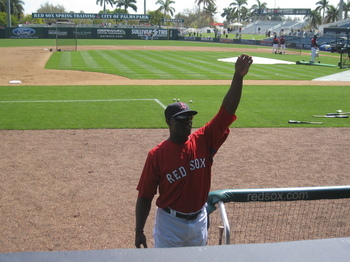 Torii Hunter’s ego may bother me, but I know that he’s a fabulous center fielder, and a great team leader. Lackey pitched his heart out in Game 5, and Mike Scoscia made a huge mistake in taking him out (for the record Scoscia is probably my least favorite manager in the Majors). Out of the teams that remain, I want the Angels to win. I want them to win it for Nick Adenhart, because that would be beyond baseball. The one interesting thing about having the Phillies in the World Series is that whoever wins from among the three teams that remain, that team will have two World Series victories in this decade. The Yankees won it in 2000, the Angels won it in 2002, and the Phillies won it last year. The question is, who will it be? And it is that unanswered question that keeps me watching baseball. It seems that anything of significance in the baseball world happens in my English class. When the MVPs were announced, I was in English. When the HOF inductees were announced, I was in English. 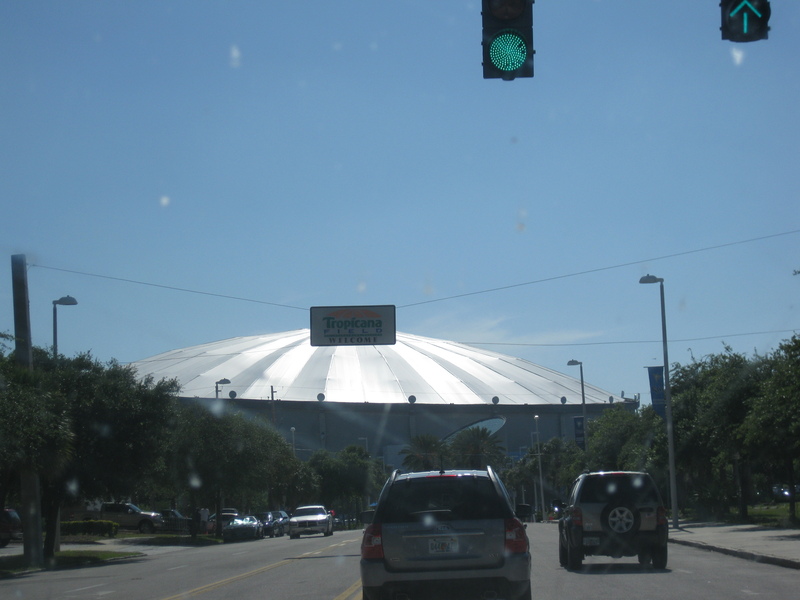 And when Josh Beckett took the mound for the Red Sox against the Boston College Eagles, guess where I was? English. On my way, I was searching for someone that I could beg to borrow his or her phone. No such luck. I was not able to see whether Josh Beckett’s first pitch was a ball or a strike. I did feel like I contributed to that game in some way, shape or form. I’m very superstitious when it comes to baseball, kind of like Jane as she describes in her book. Well, as I was taking my notebook out for my American History class second period, I realized that I had a Yankee book in my backpack. ‘That can’t be good chi,’ I thought, so I asked my friend to guard it in her locker. Nothing personal Jane, just superstitions. The Red Sox beat the Eagles 7-1. A couple minor leaguers, including Chris Carter, had a nice game, and Josh Beckett fired two perfect innings and struck out two. Disappointed as I was for missing the afternoon game, I was quite excited when I found out that the evening game would be broadcasted on MLB Network. 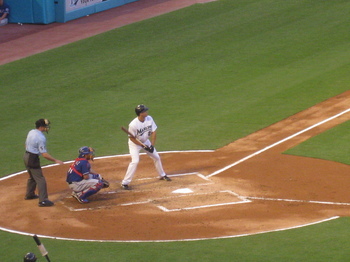 Jacoby Ellsbury led off the first inning by swinging at the first pitch he saw. ‘Patience!’ I thought! Well, he learned from his mistake in his next at-bat, and waited a few pitches before flying out to left. The important part is, he did make contact. Dustin Pedroia collected the first hit of the game, hitting a nice double, which isn’t surprising for a guy coming off an MVP season. I watched in awe as Tim Wakefield took the mound for the Sox. That knuckleball of his has been around since 1995. He played in Pittsburgh before that! I can’t imagine him anywhere else but the Red Sox, I’m glad that the Sox decided to pick up his option. Wake gave up three runs over two innings– a few batters were able to time the knuckle ball down, but some of the runs were just results of balls that got through the gap. The defense was a little rusty, but what can you expect after a long offseason? I just hate those blooper balls that fall in the proverbial bermuda triangle. Those aggravate me, unless the Red Sox hit one. Those balls going through the gap even got to Youkilis, it wasn’t just Diaz (SS) and Khoury (3B). By the way, did you guys see Youk’s latest Youk Fu? I thought that was hilarious! Josh Bard did a nice job catching Wakefield’s knuckleball. I think he should work on throwing over to second, because it’s pretty easy to steal considering Wakefield’s knuckleball is basically 68 mph. There was also one play in which Brad Wilkerson, recently acquired from the Blue Jays (RF) threw the ball in from the outfield and Bard tried to tag the guy before catching the ball. In the future, let’s catch before tagging :). Billy Traber tried to pull a Dice-K: loading the bases with no outs. Even though it is Spring Training, it still gave me a heart attack. Dice-K may be the only pitcher in the majors who can get himself into jams and get out unscathed. You’re not there yet Billy, baby steps. After giving up a few runs, Billy did settle down to throw a couple of nice pitches. Justin Masterson was sporting a beard, so he looks a bit older. Masterson, Delcarmen, Lopez, and Rairez all pitched beautifully, giving up zero runs over five innings. 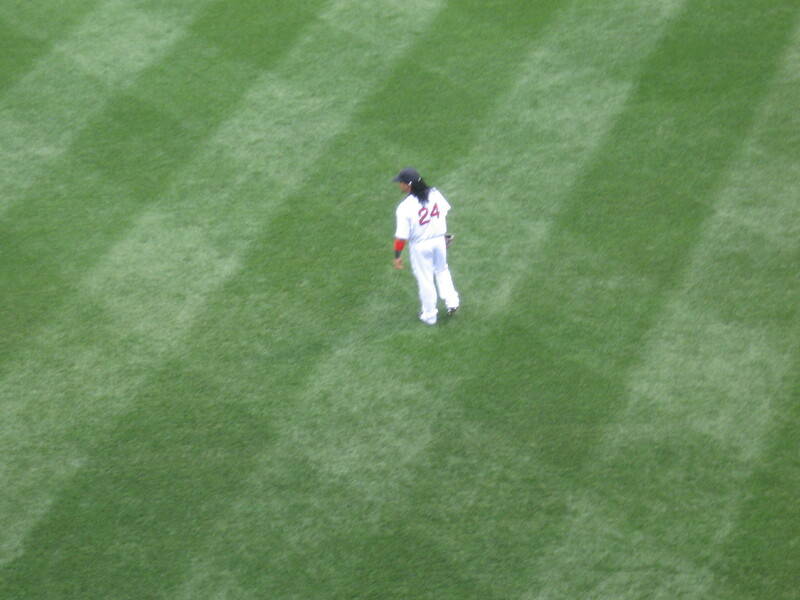 Masterson was a bit shaky at first, but he calmed down after a little bit. Let me tell you guys, I am very impressed with Ramon Ramirez. Much as I miss Coco, that was a great trade. Three up, three down and two strikeouts. Talk about a great first impression. I would make him my project, but my projects are strictly confined to minor leaguers. Speaking of projects, Jeff Bailey has pretty much secured his spot as one of my projects. I was aware of him when he was with the Red Sox in 2008, and I liked what I saw, so he was definitely on my radar for tonight’s game. I hope to see him this weekend, as well as Lars Anderson. Jed Lowrie looked pretty good tonight, solid effort with some of those balls up the middle and a nice triple with an RBI. Jeff Bailey had the other RBI. I’m in the process of getting to know these minor league guys, but I should have at least three projects by the end of the Grapefruit League. To answer Jacobyluvr’s question, Jed Lowrie was my project last year. I was waiting for autographs outside of the player’s parking lot, and he drove out slowly, so I ran into the middle of the street to get an autograph. I barely knew who he was! After that autograph though, I knew he’d be coming. Rem-Dawg was unable to join Don Orsillo at the game tonight, he has an infection. All of us here at Red Sox Nation, and even on the entire blogosphere hope you feel better. Now, the Red Sox can always call me if they need an extra play-by-play. I feel like they have a mic wired to my house because they always talk about whatever I just finished talking about within five minutes. Maybe I’ll do that someday. 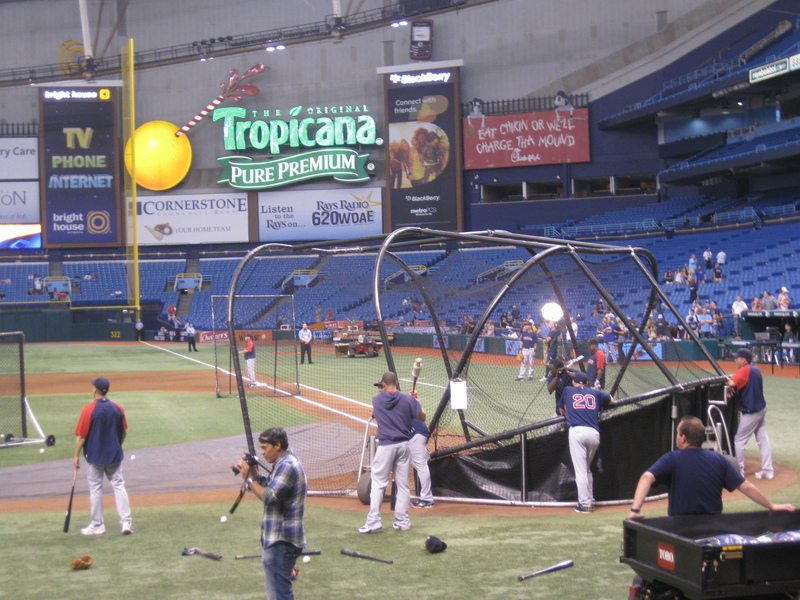 Overall, I was impressed with the Red Sox’s performance, and I cannot wait until tomorrow. I apologize for the lack of pictures, I had this post ready to go an hour ago, but as I was looking around the internet for pictures, I somehow closed this window, and the blog was lost. I’ll be bringing back some pictures this weekend! Thanksgiving Dinner Consisted of… classic baseball games? Even though baseball season is over, MLB.com/Live helps the baseball fans who are suffering withdrawal, cope with the offseason. Today, they showed Game 6 of the 2004 ALCS, a classic game. 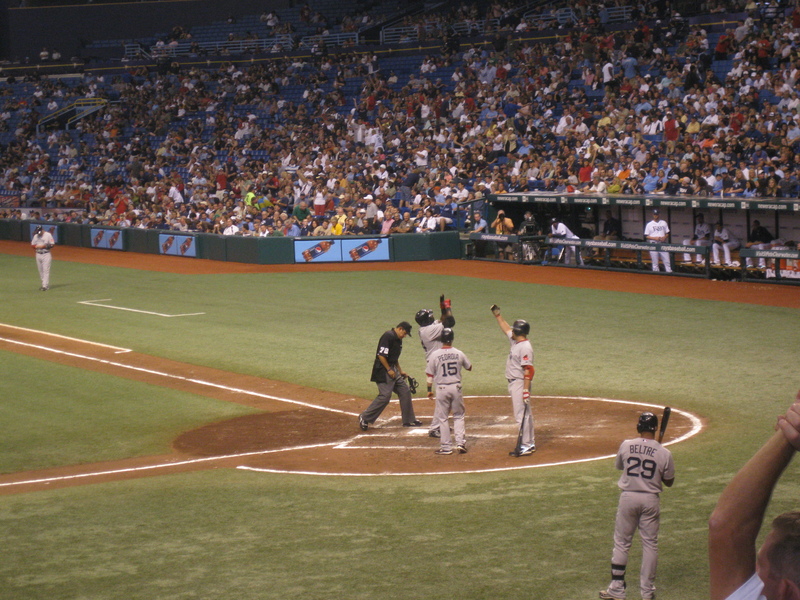 it was the game where A-Rod knocked the ball out of Bronson Arroyo’s glove, and then claimed that he didn’t do it; and it was the game where Mark Bellhorn hit a controversial three run homer. The umps had to confer twice, once when Mark Bellhorn hit the home run because it was originally ruled a ground-rule double, but replays showed that it bounced off a fan. They conferred again after A-Rod knocked the ball out of Arroyo’s glove, and replays once again clearly showed that A-Rod was guilty. As Arroyo said when he was asked to comment about the situation: “It was desperate measures, during desperate times”. If these calls hadn’t been overturned, the entire series could’ve been completely different. But that’s the beauty of baseball right? I wish I had MLB.com/Live, that would’ve been a great game to watch. It was after Thanksgiving dessert, which consisted of apple pie or chocolate cake, and we were just looking through the TV Guide for something to watch. My dad and I were absolutely thrilled when we found out that Sun Sports was broadcasting a Tampa Bay Rays Encore game. 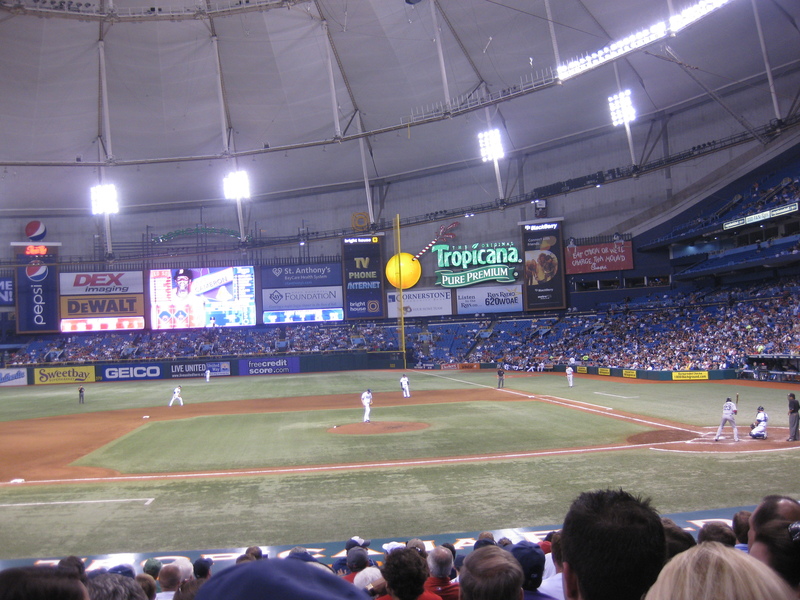 It was the game from April 27, 2008, a Red Sox vs Rays game. It was Josh Beckett vs James Shields, one of the best match-ups in the game. You guys might remember this game if you saw the highlight of Beckett’s error on a pick-off attempt, and seeing the ball roll slowly into right field, and then JD Drew’s throwing error. Both errors combined to allow Jason Bartlett to score from first base. Mike Lowell was on the DL, although I don’t exactly remember why, and JD Drew was healthy because he was playing in right field. The way that you could really tell, that it was young in the season was that a) the Orioles were in first place, and b) Manny Ramirez was still on the Red Sox. They skipped through innings, which was kind of annoying, but it was just so cool to watch Pedroia bat and think, wow, that’s the future AL MVP right there, and he doesn’t even know it yet. 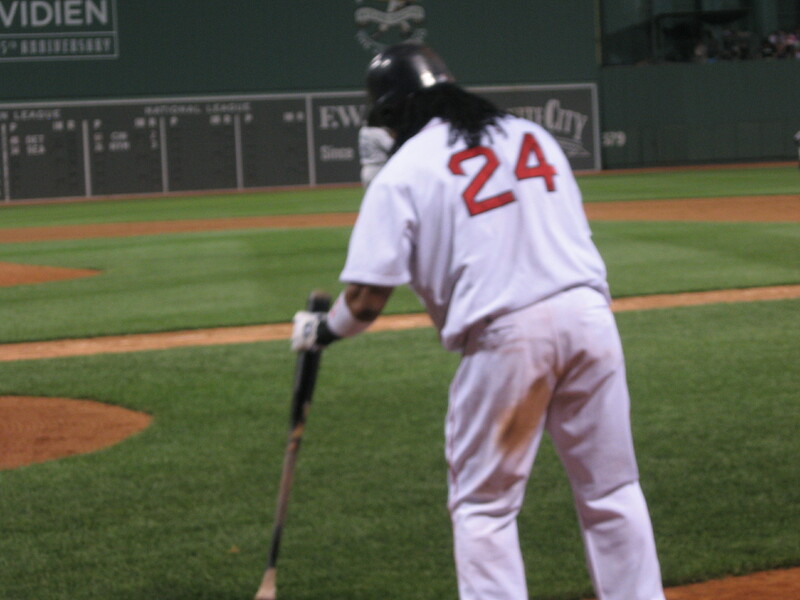 And to see Jason Varitek behind the plate and be thinking, Theo’s got to re-sign him, no matter what. I didn’t even look up the score of the game, because that would’ve ruined the beauty of baseball a little. The Sox ended up getting swept but it didn’t matter. It didn’t even matter that it wasn’t a huge playoff game, the fact of the matter was, it was baseball, and that’s all that matters. Wednesday night, I had watched the Ken Burns baseball movies, 1970-1994 edition, and it was absolutely incredible to watch. Game 6 of the 1975 World Series… Carlton Fisk’s home run. It was so beautiful. And of course, Game 6 of the 1986 World Series. I hadn’t seen “the play” in a really long time. But it was absolutely heart breaking. God do I feel bad for Bill Buckner, but to be honest, it probably would’ve taken me a long time to forgive him, I wasn’t even alive during that time period, so I don’t know how it felt live. Red Sox agony is tough, as Burns put it. Cubs agony is never even getting there, but Red Sox agony is getting so close, but seeing it slip out of your hands. Thanksgiving was great here in South Florida, we drove up to see my grandparents in Stuart, FL and we had a huge dinner. We didn’t even have turkey ironically enough, we had a great pot roast, and some apple pie or chocolate cake for dessert. In a way, my thanksgiving dinner consisted of some classic, heart breaking, baseball games as well. I hope you all had a wonderful Thanksgiving dinner, filled with plenty of food, and plenty of things to be thankful for. A toast to the Red Sox, thank you for a great season. Congrats Rays. FIrst of all, to the Rays. To beat us in Game 7, well… good job. Matt Garza pitched one hell of a game, so a tip of the cap to him. Jon Lester did pretty well himself, and perhaps JD Drew could’ve given him some extra run support in the top of the eighth if that umpire had correctly called that pitch. 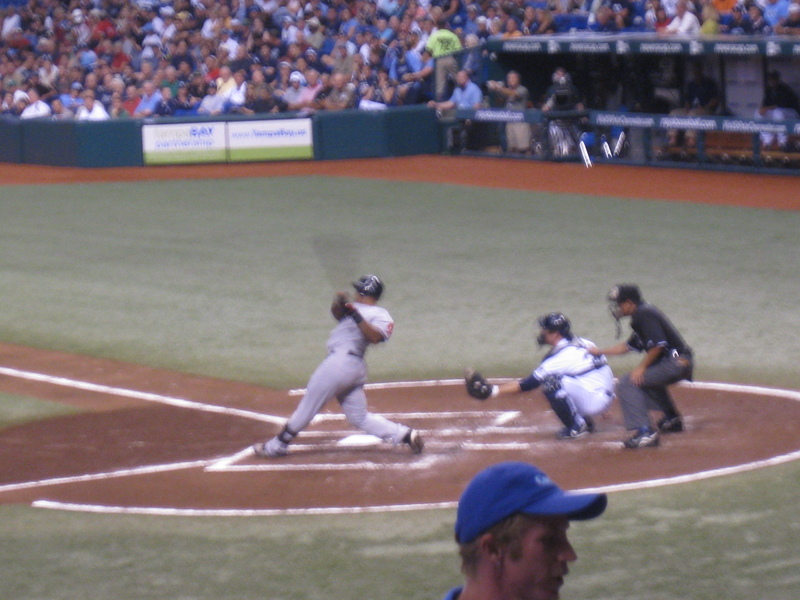 Dustin Pedroia produced our only run, with a home run in the top of the first. I’m thankful that TBS successfully broadcasted this one. A couple of mistakes by Jon Lester, sure, but other than that, he was pretty solid. -Josh Beckett: Thank you for pitching through your injuries. Your back spasms started in spring training, but you did all you could to help us. Thank you, and you still totally deserve the ’07 Cy Young. -Jon Lester: Thank you for being our most consistent starter, thank you for throwing a beautiful no hitter to the Kansas City Royals on May 19. Thanks for getting us to the ALCS. -Tim Wakefield: Thank you for being there for us since 1995. Thank you for adjusting to Kevin Cash after we released Doug Mirabelli before the season started. -Clay Buchholz: Thank you for throwing a 3 hitter against the Rays early in the season, I’m sorry that they tried to change your strategy. I think that you’ll be able to fix it. Thanks for persevering though. -Paul Byrd: Thanks for pitching some strong ball after we got you. 4-2!!! Thanks for going to the bullpen when we needed you too. -David Aardsma: Thank you for a few innings of solid relief this year. -Javier Lopez: Your delivery is pretty cool, and thanks for some pretty solid innings of relief this year, the bullpen is so under appreciated sometimes. -Manny Delcarmen: Thanks for stepping up this year when we would need you too. If Jonathan Papelbon had been overused, sometimes we could turn to you in the ninth. You worked a lot for us. Thank you. -Mike Timlin: Thank you for always assuring me when a game is over (just kidding, that’s really mean of me). Thanks for having such longevity and always being ready for us with a great attitude. -Justin Masterson: Wow. You started in AA this season, and now you’re basically our eighth inning set up man, and a potential future starter. Thanks for stepping up, and performing the way you did. Can’t wait to see you next year. -Hideki Okajima: Thank you for persevering through some hard innings this year. Even though you weren’t as lights out as last year, thanks for being solid in the post season. -Jonathan Papelbon: Thank you for being absolutely incredible this year, thank you for having that intimidating stare, and that 98 mph fastball that no one can hit. Thanks for being a workhorse always ready to go. *To all the pitchers in general: Thanks for a great season, working through the tough ones and always being ready. It was a hard year, THANK YOU! -Jason Varitek: Thank you for setting the example for this great team, and leading us in the right direction always. Thank you for persevering through a tough offensive year, and please re-sign with the Red Sox, for the health of Red Sox Nation. -Kevin Cash: Thanks for stepping up and catching all of Tim Wakefield’s games, it’s a huge help to give a day off to our captain and it’s hard to catch knuckleballs. -Kevin Youkilis: Thank you for being the rock of the Red Sox, thank you for getting clutch hits and lots of RBIs, you’re one of the biggest reasons we got to the post season. -Sean Casey: Thank you for making me laugh that one time you over ran second, thank you for being the mayor and always light spirited. -Jeff Bailey: Thank you for getting those few home runs, but I know you got them! I hope to see you up again! -Mark Kotsay: Thank you for getting those few few few hits in the post season, but they were important. Thanks for playing some solid defense, it made a difference! -Dustin Pedroia: Thank you for being in only your second season, and playing like a maniac. 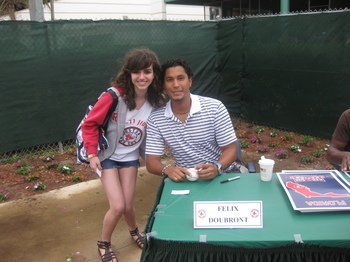 Thank you for being one of the best hitters in the majors, thank you for being so cool! -Jed Lowrie: Thank you for stepping up when Julio got hurt! You play a great short stop and you are a pretty good hitter. I hope to see you in the future. Thanks for signing my ball. -Mike Lowell: Thanks for playing well when you could, and thank you for trying to persevere through your injuries. Thanks for playing a solid third base. I hope your surgery goes well! -Alex Cora: Thank you for being a utility infielder, you play well anywhere. -Jacoby Ellsbury: Thank you for stealing fifty bases, as a rookie. Thank you for making those wicked catches that virtually no one should make, they really made a difference. Thank you for getting some great hits, and I will always believe in you. -Coco Crisp: Thank you for stepping up in the post season, and being a good sport about not starting everyday. Thank you for stealing when we needed you to, and thank you for being AWESOME and getting into that fight with James Shields. -JD Drew: Thank you for having that wicked month of June, and thank you for turning it around this year, thank you for your clutch hits. -Jason Bay: Thank you for stepping up and having a great season after Manny left. You aren’t a replacement, you are a Red Sox. I can’t wait to see you next year. -*Ode to Manny Ramirez: I’m so sorry that you were unhappy in Boston, and I will always love you because of what you did for us. Terry Francona: Thank you for being the best manager in baseball, thank you for making all the right decisions, thank you for maintaining my trust, thank you for a great season. Red Sox: Thank you, if it wasn’t for the collective effort that makes you up, we wouldn’t have pushed it to game 7. Thank you for making me feel the magic, and performing that game 5 miracle. I will always have faith. This isn’t the end of the world, we can’t expect to win every year. If we didn’t win with our 1967 dream team with people like Yaz, and Carlton Fisk, then we definitely can’t win every year. I’m amazed that we could even get this far with all our injuries. Thanks for a great season Red Sox, probably the biggest understatement of the year. Words will never be able to describe how much I love you. Congratulations Rays, you’ve had one hell of a season.